I want to make my alarm clock “smart”. I'm very new to this stuff, that is, the hardware side. The programming shouldn't present too many problems. 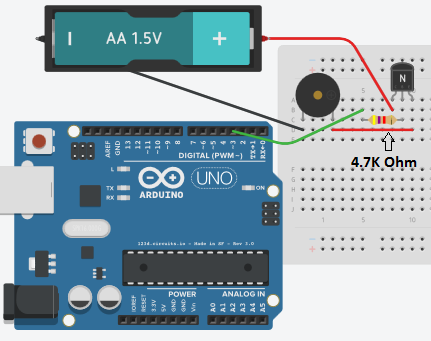 I’m currently experimenting with a simulator (http://circuits.io) and want to start with controlling the alarm’s buzzer with my Arduino. I’ve turned pin D3 to high and hooked it up to the base of a NPN transistor. I’m trying to run 1.5V through the transistor, but nothing happens. Any thoughts? You simply need to ground the circuit. In row E on your breadboard just under where you connect the - of the battery, connect that to the ground pin on the UNO. This causes the buzzer to start working. Not the answer you're looking for? Browse other questions tagged hardware transistor or ask your own question. Can I use ATtiny48 as a board in Arduino?